CAIRO – Islam and Mormonism are the fastest-growing religion in the United States in the past decade, a new census has found, The Globe and Mailnewspaper reported Thursday, May 3. “Christians are the largest group in every state,” researcher Dale Jones told a press conference. “But some of the things we found interesting was the growth of the Mormons, who reported the largest numerical gain in 26 states.” The census, by the Association of Statisticians of American Religious Bodies in Chicago, found that American Muslims almost doubled in the past decade. It estimated that Muslims are now numbered at 2.6 million in 2010, from only one million in 2001. Unofficial estimates put the number of Muslims in the US at between six to seven million. The census also found that Muslims now outnumber Jews in much of the American Midwest and South. The report attributes the sharp rise in the number of US Muslims to conversions and immigration. The survey also estimates that there are more than 2,000 mosques across the United States, of which 166 are located in Texas. An earlier Muslim study found that the number of mosques in the US jumped in the past decade to reach more than 2,000 mosques. 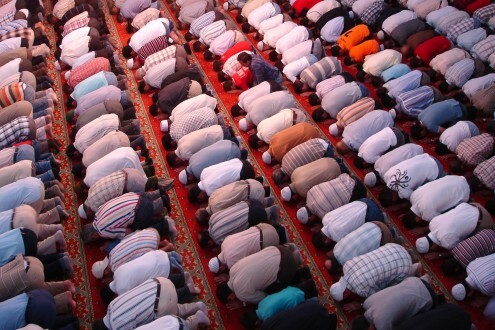 The study, released in February, also found that US Muslims are estimated at seven million. The survey also found that Mormonism is among the fastest-growing religions among Americans. “The U.S. religious landscape is shifting, and no one may be more thankful than GOP presidential contender Mitt Romney,” researcher David Briggs said in an introductory overview on the survey. Romney, the Republican front runner to face incumbent president Barack Obama in this year’s election, is Mormon. The census found that Mormons grew by 45 percent in the past decade to number over six million. It showed that Mormonism is prevalent in New York and is spread throughout the country. The study also estimated that Roman Catholics make up America’s largest religious community with almost 59 million members, or 19.1 percent of the population. “Evangelical and Conservative” Protestants come in next at just over 50 million, or 14.3 percent of Americans,” the study said. “The category ranges from the nearly 20 million Southern Baptists, who on their own would comprise 6.4 percent of Americans, to the 1.2 million members of the Silver Spring-based Seventh-day Adventist Church, or 0.4 percent of the population.” The study, however, found that a half of Christians in the US are unaffiliated with any church.